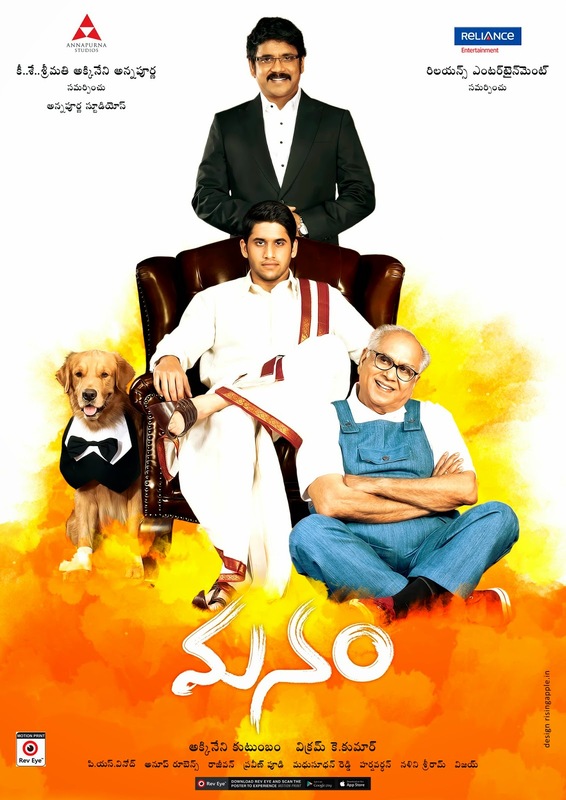 Manam is a beautiful film and a breath of fresh air in an industry usually dominated by beat-‘em-up heroes and the same old innuendo masquerading as comedy. Featuring three generations of the Akkineni family and Nageswara Rao’s final screen appearance, it could very easily have tipped into trite sentimentality, but Vikram Kumar’s screenplay keeps the film on track with an novel storyline, sweet romances and genuinely funny comedy. I have to admit that I almost didn’t buy a ticket when I read that Manam was being advertised as a comedy, since without subtitles most of the humour tends to pass me by (even with subtitles in some cases!) but Manam would have been a watchable and entertaining film even without subs. As it was, being able to understand the jokes and laugh at the same time as the rest of the audience was excellent. Long may this trend for subtitled Telugu films continue in Melbourne! The film starts in the 1980’s with the unhappy marriage of Radha (Naga Chaitanya) and Krishna (Samantha) who bicker and fight even on the occasion of their son’s sixth birthday. The very next day they are both killed in a car accident, leaving the young Bittu an orphan and his wish to see them happy together unfulfilled. This doesn’t seem to have held Bittu back however, as the film moves to the present day, and the now grownup Nageshwar Rao (Nagarjuna) is in Mumbai to receive the Businessman of the Year award. However, on the flight back to Hyderabad, Nageshwar is seated beside a young man who is the image of his late father, and this begins his crusade to bring his ‘parents’ back together again. Nagarjuna is absolutely perfect here and his child-like wonder at discovering ‘his father’ is brilliantly portrayed. The scene is well written too, with the just the right amount of comedy to keep it from cloying sentimentality and Vikram Kumar even manages to make the suggestion of such an occurrence seem perfectly plausible. Nageshwar reasons that if his father has been reborn, then his mother must be around somewhere too, and to this end he scours the streets of Hyderabad until he tracks down Priya (Samantha) who is the image of his mother and, luckily for Nageshwar and his plans, she immediately feels a connection. Again Nagarjuna’s determined search is neatly summarised in just a few shots and the obvious unlikely coincidences feel much less contrived than expected. It help that both Nageshwar and Priya are very likeable characters and Nagarjuna and Samantha ensure their interactions are full of genuine warmth and respect. Having found his re-incarnated father and mother, Nageshwar has to find a way to re-ignite their romance. In the midst of his attempts to bring about true love, Nageshwar finds love himself when Anjali (Shriya) commandeers his car to carry a sick man to hospital. As it turns out, the older man is Chaitanya (Akkineni Nageswara Rao) who has seen his parents Seetharamudu and Ramalakshmi reborn as Nageshwar and Anjali. It’s then his turn to explain the past and try to reunite the lost lovers. ANR is the absolute star of the show, and seems to take great delight in playing the octogenarian matchmaker. He is mesmerising every time he appears, and his facial expressions and reactions to every other character are superb. For his part, Nagarjuna is quietly competent as Nageshwar Rao with a subtle but effective performance, and his romance with Ramalakshmi in the second half is an absolute delight to watch. There seems to be something in Temple’s theory that Shriya Saran’s irritation factor is related to the length of her hair, as here she has long hair and is actually pretty good. Shriya looks beautiful and displays an engaging personality as a 1920’s traditional villager, and she is just as stunning as the cool and efficient Dr Anjali. I vote Shriya always has long hair in her movies! Nagarjuna and Shriya also share good chemistry together, which is sadly conspicuously absent in the romance between Samantha and Chaitanya, although to be fair the script really doesn’t ever let them develop much sparkage except in the way of confrontation. Despite the lack of passion with Chaitanya, Samantha shines as Priya / Krishna. She sparkles in her songs, and is full of bubbly enthusiasm as she meets Nageshwara, but her pain at her perceived husband’s betrayal is obvious as is her contempt of Chaitanya’s Nagarjuna. Chaitanya is also better than usual, although that may be because his role mainly requires him to play a drunk and obnoxious college student which he seems to fit well. The usual suspects pop up as various mothers, fathers, cousins etc, but do watch out for the brief cameo appearance of Amitabh Bachchan which garnered plenty of cheers from the audience. It’s not all perfect though – the inclusion of Ali as a dance teacher is unnecessary and M.S. Narayana’s role is too obvious and crude to fit with the rest of the characterisation. However Brahmi is good as Nagashwara’s assistant and without any misogynistic humour, he manages a restrained performance that proves he can act perfectly well when required. Manam benefits from a sweet and simple telling of a relatively convoluted story. There are no exciting car chases, no big fight scenes and no cliff-hangers (even though the last few minutes attempt to raise the dramatic tension), but overall it’s an entertaining and watchable film. All praise must go to Akkineni Nageswara Rao and Nagarjuna for their exemplary performances, but the younger generation hold their own, with even Chaitanya showing that he learnt something from the rest of his family while on set. Definitely recommended viewing and a last performance to savour from one of the legends of Telugu cinema.